During its next phase of existence three wings of buildings and a new $85,000 gymnasium called “the best gymnasium east of Berkeley” were constructed to serve primarily Placer Junior College, but Placer High School students shared many of the facilities and organizations with the new college. It was an amazing period of time in which the school shared the American experience of the Depression, World War II, the atomic bomb, the Korean War, the Cold War and the satellite age. School officials and policies emphasized democracy and countered communism in the face of these world events. As a result students were held to obtainable standards and were helped and encouraged to make these same standards their own. determination of will and the love of knowledge and teaching, he brought a cultured and educated outlook into his students lives. Strict and unyielding, Barooshian introduced his young students to world history and classical music. He also taught at placer junior college and also became one of Auburns most well known teachers. Earl Crabbe continued his career during this time, leaving coaching but creating journalism program at both the high school and college. The two school published the Placer Union newspaper with college students producing the paper first semester and the high school continuing production during second semester. Howard Woodside also joined the high school staff during this period of time, coaching baseball and football before moving on to an illustrations career at Placer Junior College. Frank Bonito became the FFA advisor and rifle team coach, capturing 4 California state championships and 1 US title between 1951 and 1955.
created scores of championship teams in basketball and track. His cross crounty teams won 74 out of 102 meets and his track teams won 123 out of 150 meets. In 1941 a very personable and young coach Kendall Arnett, became the football, basketball, and baseball coach. He began the Block “P” society and initiated the annual Block “P” Patriotic Basketball Tournament in 1943. He died suddenly and unexpectedly in 1954 and the school renamed it the Kendall Arnett Memorial Tournament. It has since become the oldest basketball tournament in Northern California. During this era students experienced the Depression and were aware of being plunged into world conflict. On more than one occasion the yearbooks of the forties spoke of the students’ fears of entering an adult war disheveled by war. By 1943 a key element of the history and heritage of the school was missing. Students found that classmates, friends, and athletes of Japanese descent had been removed to internment camps throughout the West. The Placer Victory Corps was instituted with a special schedule during third period daily in which students became familiar with their own aptitudes and determined their place in the war effort. 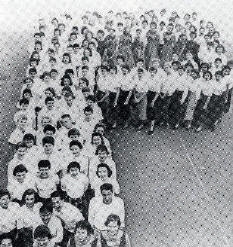 The school continued its academic reputation with Placer Graduates attending UC Berkley placing first in the scholastic ratings at the university, beating out 149 other schools in the five year period from 1935 to 1940. The Music Department continued to improve with the high school band combining with the junior college band until 1940. The girl-ask-boy dance tradition began with the creation of the annual Sadie Hawkins Dance based on the characters from the Lil’ Abner comic strip. And the first female student body president, Barbara Billing was elected in the 1948-49 school year.